Newark, NJ – Essex County Executive Joseph N. DiVincenzo, Jr. announced plans to upgrade the baseball field in Essex County West Side Park on Tuesday, January 23th. 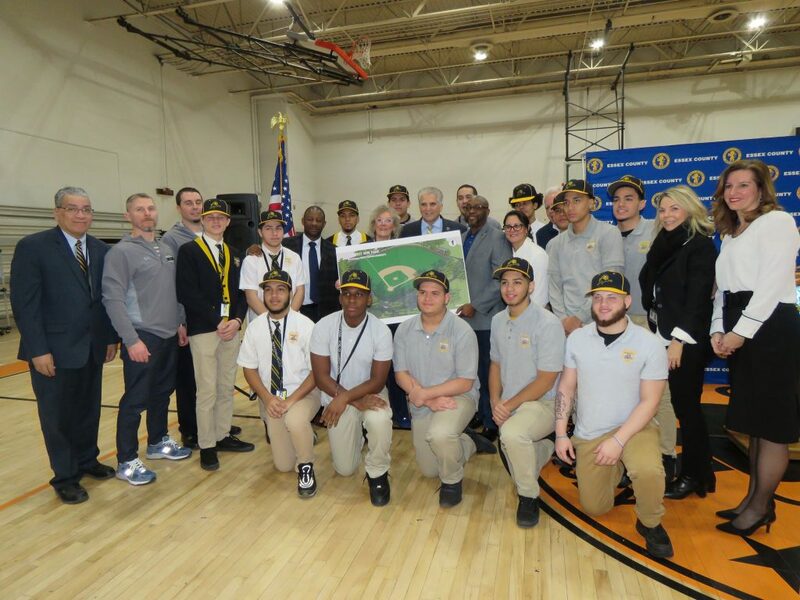 The modernization is being made possible through a partnership with the Essex County Schools of Technology, which will utilize the facility as the home field for the Essex County Donald M. Payne, Sr. School of Technology boys’ baseball team. The upgrades are part of the County Executive’s ongoing initiative to provide modern facilities to meet the needs of the community. “Modernizing our playing fields is important because members of the community rely on the county to provide facilities for sports and recreational activities. The baseball field upgrades benefits the Payne Tech boys baseball team, but also ensures our residents have the finest fields on which to play,” DiVincenzo said. “West Side Park has become the centerpiece of the neighborhood and is a symbol of the rebirth and growth of this community,” he added. “The upgrades to the West Side Park baseball field will ensure that our Payne Tech boys’ baseball team has a home playing field. It will be a great addition to the community and will help in fostering a strong sense of unity with our students,” Essex County Schools of Technology Superintendent Dr. James Pederson said. “I can’t thank the County Executive enough. First he gave us a brand new school building and now we are getting a new field,” Essex County Donald M. Payne, Sr. School of Technology Principal Eric Love said. “I thank the County Executive for the resources he is providing to the district and I look forward to building a great tradition on this field,” Essex County Schools of Technology Athletic Director Gerhard Sanchez said. “We thank our County Executive for his vision to improve our recreation facilities and ensure our youth have modern and safe fields to play on,” Freeholder Vice President Wayne Richardson said. “I am thrilled we are able to work with the County Executive and share his vision to provide the best facilities for our students,” Freeholder Patricia Sebold said. “Congratulations to Joe and the work being done to provide the best facilities. But just as important is the achievements you have in the classroom. With sports and great academics, there is no limits to what our students can achieve,” Assemblywoman Eliana Pintor Marin said. “Here we are again talking about improving the quality of our parks. With all the reasons young people have to stay indoors these days, Joe, you are giving them another great reason to get outside and play,” United Community Corp. Executive Director Craig Mainor said. The baseball field was first outfitted with a synthetic grass playing surface in 2007. Because of the age of the artificial grass surface and normal wear and tear, it needed to be replaced. A new synthetic grass surface will be installed on the baseball field and new fencing, dugouts, scoreboard, trash receptacles and park benches will be installed. A restroom building adjacent to the field will be renovated. The improvements were designed in-house by the Essex County Public Works Department. Landtek Engineering of Amityville, N.Y., was awarded a publicly-bind contract of $1,582,620 to perform the construction work. These upgrades are being funded with a grant from the Essex County Schools of Technology. Work is scheduled to be completed before the start of the spring 2019 baseball season. In 2004, a 22-car parking lot was created, the main park entrance was revamped for better access, restroom facilities near the tennis courts were renovated, and the park entrances along 17th Street were enhanced. In 2006, a major aesthetic renovation of the lower section of the park was undertaken. In the spring of 2007, the New Jersey Tree Foundation beautified the park by planting 40 new trees inside the park and along the park’s perimeter. A synthetic grass baseball field was installed and the locker room and rest room facilities were renovated in November 2007. In 2009, a new spray park with climbing apparatus and a synthetic safety surface was developed. In 2015, the Community Center received a complete renovation with new flooring, windows, doors, HVAC system and lighting. In 2016, the playground was modernized with new equipment and a rubberized safety surface and the parking lot was expanded. In 2017, the football field and rubberized running track were updated with new surfaces. Essex County Executive DiVincenzo has partnered with the New Jersey Green Acres program, the Amelior Foundation, MCJ Foundation, the Essex County Recreation and Open Space Trust Fund Advisory Board, West Side Park Conservancy, Tri-Cities Peoples Organization, United Community Corporation, the Boys and Girls Club of Newark and the Essex County Division of Housing and Community Development to secure grants to fund the improvements made to Essex County West Side Park. The Essex County Park System was created in 1895 and is the first county park system established in the United States. The Park System consists of more than 6,000 acres and has 23 parks, five reservations, an environmental center, a zoo, Treetop Adventure Course, ice skating rink, roller skating rink, three public golf courses, golf driving range, two miniature golf courses, four off-leash dog facilities, a castle and the Presby Memorial Iris Gardens. West Side Park is located on 31.36 acres of land in Newark’s Central Ward and is the ninth-largest park in the County’s system. Land for the park was acquired in 1895 and West Side Park was one of the original five parks in the Essex system.